The flowers our Kemnay Florists work with are of premium quality as they have been directly imported to us from our cultivators in Holland, a region of the Netherlands renowned for the quality of their flowers. Combined with up to four deliveries from our suppliers per week, not only are the flowers our Kemnay Florists work with of the highest standard but they are also the freshest with a high longevity so your recipient will be able to enjoy their flowers for many days to come. 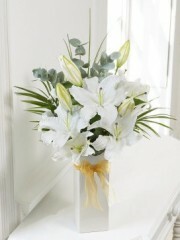 Our Kemnay Florists are able to create the most stunning bouquets suitable for all occasions - for example: birthday events, congratulatory occasions such as passing an important test all the way to larger scale events such as weddings - so no matter what you're looking for, we are positive we have the ideal bouquet for you. Our Kemnay Florists use flowers such as elegant calla lilies, traditional roses, exotic gladioli and orchids amongst many others and arrange them amidst a bed of lush greenery such as eucalyptus leaves. Once the actual bouquet has actually been arranged, our Kemnay Florists wrap up all our bouquets in gorgeously vivid yet simple papers, tissues and ribbons or can even place your flowers into a vase, box or even into a cute teacup depending on what sort of effect you're looking for. Our customers are also able to customise the bouquet by asking our Kemnay Florists by adding a personalised card message or you can even create a completely unique bouquet using our bespoke service. The bespoke service allows you to tell us exactly what your bouquet should look like and our Kemnay Florists would be more than happy to create something that is within your specific requirements. Our Kemnay Florists want to do everything they possibly can when it comes to your orders no matter how big or small your request may be. Once your order has been arranged by our Kemnay Florists, our customers have the option to use one of our several delivery services if you so wish it. We have our standard delivery which runs weekly every Monday to Saturday, our next day delivery service as well as our same day delivery service. The same day delivery service is perfect for those occasions that have cropped up out of the blue as it allows our customers to place an order and have it delivered on the same day. This means that our Kemnay Florists arrange your bouquet on the day which is why if you wish to use this delivery service, your order must be placed before 3PM. 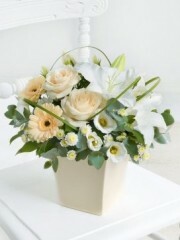 This is in order to give our Kemnay Florists enough time to arrange everything to their highest standard. When it comes to our deliveries, unfortunately we are unable to promise specific time deliveries however we do have our AM and PM deliveries. This simply means we are able to deliver either before 1:30PM or after 1:30PM but asides from those two time frames, we simply can't promise our customers specific time deliveries as we can't control elements such as traffic or the weather. We want our customers to be fully satisfied with the service we provide which is why our Kemnay Florists want to take care of everything on your behalf once your order has been placed.